Spooky Chocolate Pumpkin Cake – I'll Make It Myself! Happy Halloween, readers! 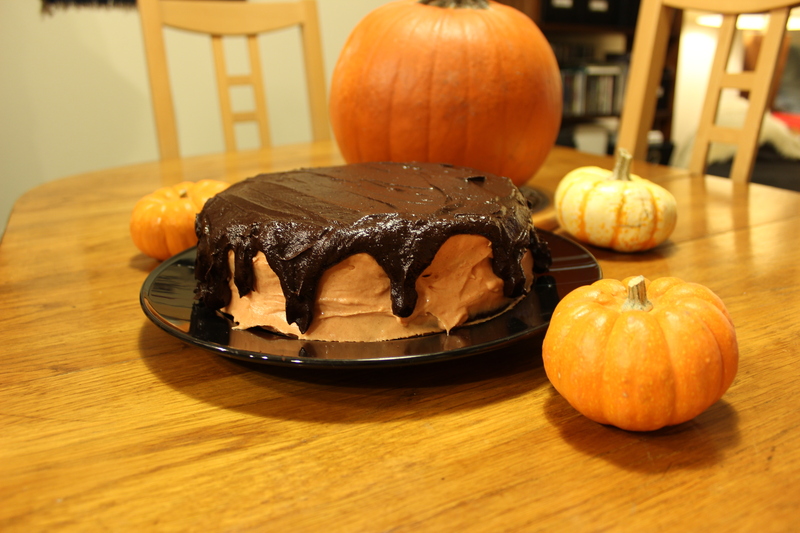 How about a spooky chocolate-pumpkin cake with cupcakes that you can make in Japan? My chocolate ganache didn’t turn out as runny as in the original because I had to reheat the chocolate since I didn’t chop it finely enough. If your ganache is thick, work it over the sides with the silicon spatula. I’ve added both ways to the instructions. Adapted slightly from The Little Epicurean. 1. Preheat oven (yonetsu, 予熱) to 180°C (350° F). Grease lightly two 8-inch/20-cm cake pans and line with parchment paper. Prepare 12 silicon muffin cups or grease/line a 12-cup muffin tin. 2. In a medium bowl, sift the dry ingredients (flour, cocoa powder, baking powder, baking soda, salt and spices) together. Set aside. 3. In another bowl, whisk together buttermilk, yogurt, pumpkin/kabocha puree, and vanilla. Set aside. 4. In the largest bowl, cream together butter and sugars with the hand mixer on medium. Add eggs one at a time and use a silcon spatula to incorporate. 5. Mixing on low, alternate dry mixture and wet mixture to butter mixture in three additions until incorporated. 6. Fill muffins tins 2/3 full with batter. Divide remaining batter between the 2 round pans. 7. Bake cupcakes for 20-25 minutes, or until toothpick inserted in the center comes out clean. Bake cakes for 30-35 minutes, or until toothpick inserted in the center comes out clean. (Japan: this will take ~30 min for each cake round and ~25 for the 12 cupcakes, depending on the size of your oven range–a total of ~90 minutes.) Let cake cool slightly before unmolding and allowing to cool completely. Orange (or red and yellow) food coloring (original calls for gel; I used liquid. If in Japan, use powdered if you can’t get liquid: shokuyô aka, 食用赤, and shokuyô kiiro, 食用黄色. 1. Cream together butter and cream cheese with (clean) hand mixer until fully incorporated. 3. Frost the cooled cake with a silicon spatula. Set aside in refrigerator for 15-30 minutes. Frost the cupcake cakes. 1. Using a chef’s knife or santoku, chop the chocolate very finely. Place chocolate, butter, and corn syrup/honey/mizuame in a heat-proof medium bowl. 2. Gently bring heavy cream to a boil on the stove. For a thin glaze: Pour cream over chocolate, etc. Let sit for 1 minute, then, using a silicon spatula, gently stir until smooth. Let glaze sit for 5 minutes until it slightly thickens. For a thicker glaze (see photo): Take cream pot off heat. Add the contents of the bowl to the pot and melt chocolate mixture over low heat for 1-2 minutes until fully incorporated. Let cool for about 5-10 minutes. 3. Pour glaze over the chilled frosted cake. Allow glaze drop over the sides; if it’s thick, use the spatula to push some over the side to create the “drips.” Refrigerate cake for 15-30 minutes before serving.